Storing Up or Driving Through? A package of 40 water bottles. 45 rolls of toilet paper. Goldfish crackers, chicken nuggets and loaves of bread to last for a month. Yes! I love going to Sams Club! My cart gets overstuffed every single time and sometimes it’s difficult to push it by the time I get to the check-out area. Everything there is in BULK. You can’t just run in there and get a small item. You can’t get one of anything. Nope. This kind of store is designed for people to stockpile their favorite items. When I pull out of the parking lot I realize I won’t be back here again for at least a month…maybe longer. I breathe a sigh of relief knowing I won’t have to worry about purchasing these things for some time. Ever wish you could stockpile other things? For instance, how about grace? Now I could definitely use a month’s worth of that! Wouldn’t it be cool? Bam! Here you go…all the grace you’ll need for at least a month. What about patience? Yep. Every parent would fork over a chunk of change to buy even a week’s worth of patience to dole out on their stubborn-strong-willed children. Just open up the pantry where all the other bulk stuff is stored and grab a jar of patience for the day. Oh, and wouldn’t it be ideal if we could buy a big bulk package of wisdom? If that were possible, I’d fill as many carts as I could push and load those packages up in a truck. I wouldn’t have to worry about asking for wisdom for a very long time. But it doesn’t work that way. Not at all. God did not design us to stock pile these attributes in bulk. He doesn’t just dump a load of grace, patience and wisdom on us and say, “This should last you a while; see you next month.” Why??? Why can’t it work that way? He wants us to come to Him DAILY. He longs for a relationship with us. He wants us to depend on Him moment by moment. Not month by month. When Jesus was teaching his disciples to pray in Matthew 6:11, he said, “Give us today our daily bread.” Notice the word daily. Nothing in there about a Sam’s Club portion of bread. In Exodus 16:4-5 God instructed the Israelites to gather up only a day’s worth of manna. He even warned them that if they tried to gather more than that, it would spoil. He did this to test them and see if they would rely on His provision for each day alone. Back in those days they didn’t have the extra freezer in the basement to store a month’s supply of beef on sale. They didn’t even have a refrigerator to keep things cold. They truly had to focus on the food for each meal at a time. Which is just how God wants us to relate to Him. He wants us to rely solely on Him. One moment at a time. As ideal as it sounds, we just weren’t designed to store up grace for a month. God promises His grace is sufficient. And it is. But when I worry about something next week or something way down the road, there’s no grace given to me yet for those things. I can’t just go to my pantry and pull out an ounce of grace for next week’s problems. Do we sometimes go to church on Sunday and think we’re good to go for the week? I’m quite guilty of this at times! Yep, I’ve stocked up on enough wisdom to get me through til next week. I’ve got enough living water to soak up until next time. And then we attempt to plod through our week thinking we have enough stored up. But before Tuesday comes, we’re bewildered as to why we’re feeling dried up. We’re thirsty. And we desperately need a drink. When running errands with my daughter on a hot summer day, a familiar scenario plays out. After getting in and out of the car multiple times and then sitting in traffic, we realize we are thirsty! Those 40 bottles of water from Sams sitting in the pantry at home don’t do us any good in that moment. Not at all. So we pull over to the closest fast food place we can find and order a large ice-cold water or lemonade through the drive-through. It hits the spot perfectly. It satisfies our thirst. At this point it wouldn’t matter if there were 400 bottles of water at home in the pantry. We get thirsty daily. And sometimes it happens when we least expect it. No amount of planning ahead would solve the problem. All we know is that we need something to drink in that moment. Dear friend, if we want to have a real, deep relationship with our Heavenly Father, then we have to get rid of our Sam’s Club mentality. And then replace it with a “gotta-have-a-drink-right-now” approach instead. Just enough for one day. One moment. One desperate drink at a time. Are you trying to cram as much as you can into one shopping spree? 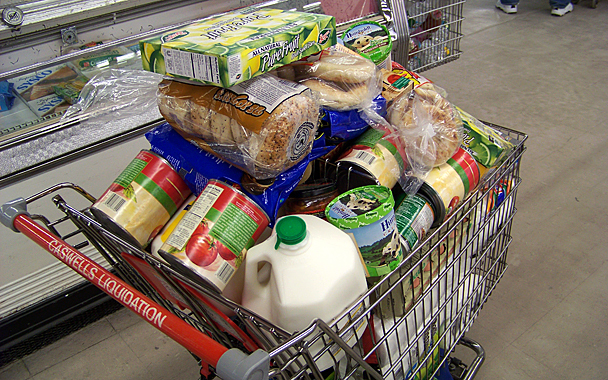 Is the cart of your heart so heavy you can barely push it down the aisle? Get enough for one day. Just as Sam’s Club seems to have a never-ending supply of bottled water, toilet paper and chicken nuggets, our Heavenly Father has more than enough love to lavish on us. ← Look at the Birds!